Riddleblog - The Latest Post - Who Might This Be? 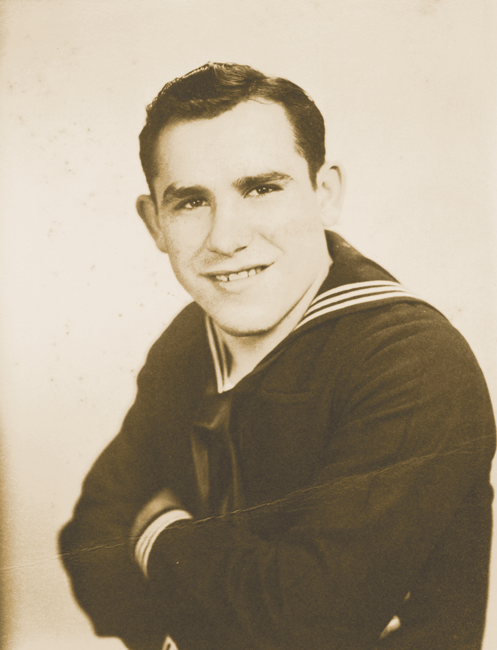 This young man was a gunner's mate on the USS Bayfield (APA-33) on June 6, 1944, and participated in the D-Day invasion. He is now a household name. Whoever is probably around 90 now. (or would be if now dead.) Hmmm. I was thinking Johnny Carson, but Wikipedia (YMMV) says he was in the Pacific. June 6, 2014 | "lee n. field"
He is a beloved and famous St. Louisan. In my humble opinion, he made one mistake, playing for the Yankees as long as he did. He should have been Cardinal!!!! Looks like Kenneth Copeland's dad. Why of course.... It's the 3RD EAGLE OF THE APOCALYPSE." The "3 stripes" on his shirt and cuffs give him away. Definitely Yogi, or someone else. Yogi Berra was my first thought!